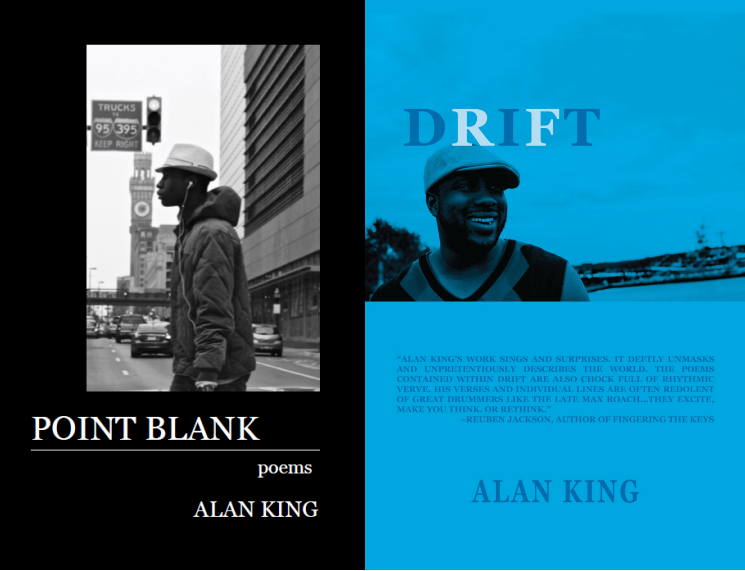 Alan King is an author, poet, journalist and videographer, who lives with his wife and daughter in Bowie, MD. He writes about art and domestic issues on this blog. He’s a communications specialist for a national nonprofit and a senior editor at Words Beats & Life‘s global hip hop journal. As a staff writer for the Baltimore Afro-American Newspaper, King often out-scooped the Baltimore Sun when covering housing and the Baltimore City Council. His three-part series on East Baltimore’s redevelopment and the displaced residents brought together stakeholders (community leaders, elected officials and developers) to work out a plan that gave vulnerable residents a role in helping to build up the city’s blighted neighborhoods. During a trip to Kingston, Jamaica, King introduced AFRO readers to the island’s rich history by highlighting its national heroes such as Marcus Garvey and Bob Marley. Additionally, his historic pieces from slavery to emancipation helped his readers understand the significance of the island’s 47th Independence Day celebration. As a research assistant at the Center for Public Integrity, a government watchdog organization of investigative journalists, King helped compile examples of corruption for The Buying of the Presidency 2008 book. King’s honors include fellowships from Cave (cah-veh) Canem (cah-nem) and Voices of Our Nations Arts (VONA) Foundation, three Pushcart Prize nominations as well as three nominations for Best of the Net selection. He’s a graduate of the Stonecoast MFA Low-Residency Program at the University of Southern Maine. His poems and short stories appear in various literary journals, magazines and are featured on public radio. Really enjoyed the reading so far. Looking forward to your blog’s success. Thank you so much for the encouraging words! Can’t wait to check out the next Uncle Q’s Livingroom. I discovered your blog through Bloggy Award and I just wanted to let you know I had a great time. I hope I can visit often; also published a review. Have a good one! Hi, Alan! This is a great blog! Your activism is noble and I hope that the Internet will continue to connect us in a way that leads to a more harmonious way of life. I’m working on using Social Networking as a way to keep foster youth connected to one another and resources available to them. Check out our blog (lifeskillslamc.tumblr.com), still in its nascent stage and our social networking site (youthscoop.ning.com). Hi Alan! I love the focus of your blog. I hope interest spreads. I recently helped the Mott Foundation with a project to promote its grantees in South Africa during the World Cup. Community leaders are blogging daily about the country’s past and future. Their raw insights hopefully are giving game followers a sense of the people, issues and needs in South Africa. Please check out the blog and let me know what you think – or spread the word. Robyn, thanks so much for stopping through the blog! I will definitely check you out and spread the word. I love the look and layout of your blog. Easy on the eyes and even easier/fun to navigate. Congrats on your successes and I will be checking back! Thanks, Zoe! I’ll definitely return to your blog, too. Thanks for the idea on my next post! When the award is accepted, there are certain rules to follow. Thank the blogger who presented me with the award. Post a photo of the award. Share ten things about me that my readers don’t know. Choose six people to present this award to. Definition: Pay it Forward. Let the six bloggers know they have been awarded (and make their day too)! Thanks for the award stronghearted1! Yess! I’ve stumbled across a respected poet, teacher, journalist, and a Washingtonian. How good does it get? Your work is inspiring. I’m looking forward to keeping up with you. Don’t leave D.C., we need you! I just discovered that you created a link to my blog. Thanks!! I really appreciate it. I’m lovin’ you site. Thanks! I love your stuff, too. I’ll hold you to that beer (ginger beer, though; not a drinker). Thanks, again. Can’t wait for your next post. Lol. I’ll bring my own. I’ll have to take your word on that. Indeed, they do 🙂 I’ll check your blog out. Thanks for stopping through and following. Nice to meet you, Nomzi! I’ll have to check out your site or Google you to check out your work!